Home>> Blogs>> Should I pay off my home loan early? Where is the real cost of a mortgage? What effect does making extra payments have? The lifetime of a mortgage in New Zealand is usually between 25 to 30 years. Because the mortgage lasts so long you end up paying about the same amount back in interest as you have borrowed in principal. If you look at the infographic in the next section, you will see that when you borrow $300,000 over 30 years @ 5.45% you end up paying back $609,533 in total. Wow, $309,533 just in interest payments, that’s more than what was borrowed in the beginning! That’s the real cost of a mortgage, because it lasts so long you end up paying the loan off twice, once for principal and once for the interest. I got a raise and now have $50 cash left each week, so that’s $100 per fortnight extra I can put on my mortgage. 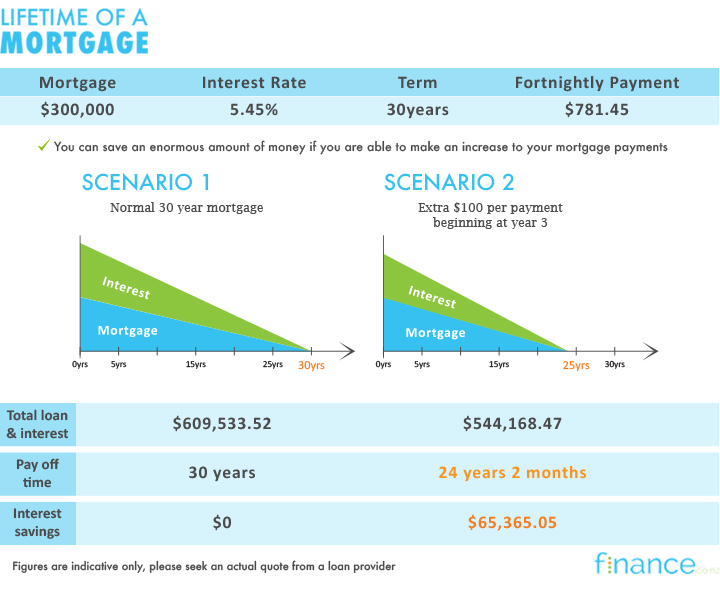 Comparing the two scenarios below shows how you can really gain value out of directing extra funds into your mortgage. Cutting a whopping 5 years and 10 months off the mortgage lifetime and a saving of $65,365 in interest. The key is that you pay interest for a shorter period of time and that translates into a significantly smaller debt. 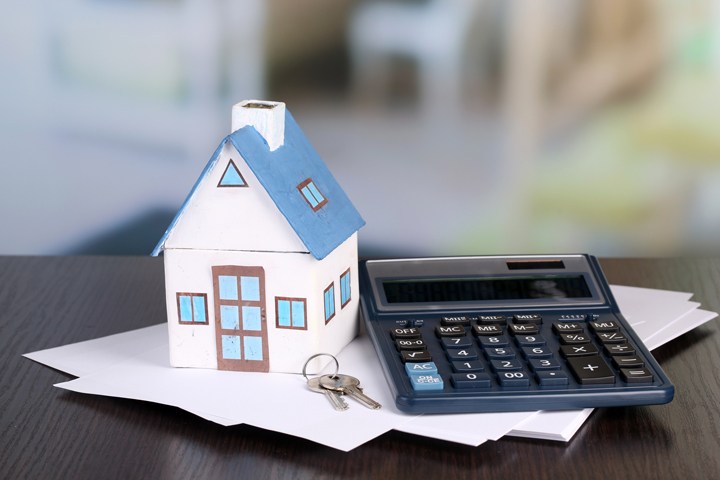 There’s no question that the figures above show a fantastic benefit from putting extra funds into your mortgage but that doesn’t necessarily mean if you are in this position you should do it, there are other things to consider. What about alternate investments? Perhaps you could get a good return there. A good way to look at alternate investments is, how much do they return compared to the annual interest rate of your mortgage? We have used an example of 5.45% which is the approximate level of floating rates offered at the time of writing. How does 5.45% compare to what you will get from putting your money into a savings account or a term deposit? If you look on our Savings Account page you will see that the top return for a savings account with a bank is 3% and the top rate for a bank Term Deposit is 3.8% for 5 years. If the interest generated from an alternate investment does not outperform the interest rate on your mortgage, why would you do it? Safer investment products such as our two examples will always return significantly less than what you will pay on your mortgage. In order to achieve a higher rate than your mortgage interest rate you would need to go to riskier investment such as shares. To put the comment of calling shares a riskier asset into context, consider the following example. This link on the Standard & Poors website displays a graph of the returns for the NZX 50 Index. This is an index that measures the performance of the 50 largest New Zealand Stock Exchange shares. At the time of writing this article (Oct 2016), if you click on the 1 Year button you will see a figure of approximately 22.33% under 1 Yr Annual Returns. If you click on the 10 Year button that figure goes to approximately 2.25%. Timing is everything!! The general rule is that you should work towards having a diversified portfolio of investments that will be resistant to market shocks. Hopefully if one fails you have the others to fall back on. General rules aside you need to be sure that the balance of your investments suits your lifestyle and future plans i.e. there might be a good reason for you to have an emergency fund of cash available to you at short notice. If you are doing that though you definitely want to consider the Offset Mortgage Account product offered by some banks. Something else you must consider is the cost to restructure your mortgage. Usually, if you are on a floating rate you can just increase your repayment amounts without consulting your bank. However, if you are half way through a three year fixed mortgage period the bank may charge you a restructure fee to change your payments. While this would be an insignificant cost compared to what you save in our example it is better to avoid the charge altogether and time your restructure with the end of each fixing period. You may miss out on creating a diversified investment portfolio if you just put all extra funds into the mortgage. Or going even further you will not gain exposure to the chance of picking a high performing investment that can change your financial position dramatically if successful. Just because the return on an investment now is less than the interest rate on your mortgage it doesn’t mean every investment will always perform at that level. Generally, returns on investments, including the interest earnt on a savings account at the bank are taxable. However you do not pay tax on the capital gain you earn when you sell your family home. You can view the rules around property at this government site. Extra mortgage payments = less overall debt, faster payoff, shorter time to being mortgage free which is great. Make sure you understand how to compare investments and the tax implications of returns. You may miss out on other investment opportunities if you focus solely on your mortgage. There can be costs involved in restructuring your mortgage to make the extra payments. Extra money paid into a mortgage most often cannot be withdrawn if you need it again without a mortgage restructure.